Nearly three weeks ago, on January 13th, I walked outside with camera in hand to look for bugs. What I found was a beautiful chrysalis. Chrysalis found on Jan. 13, 2014. Cuernavaca, MX. I looked up and saw as many as ten similar chrysalises in the outdoor rafters. They were all vacant – newly-emerged somethings were flying around somewhere. But were they moths or butterflies? What species were they? 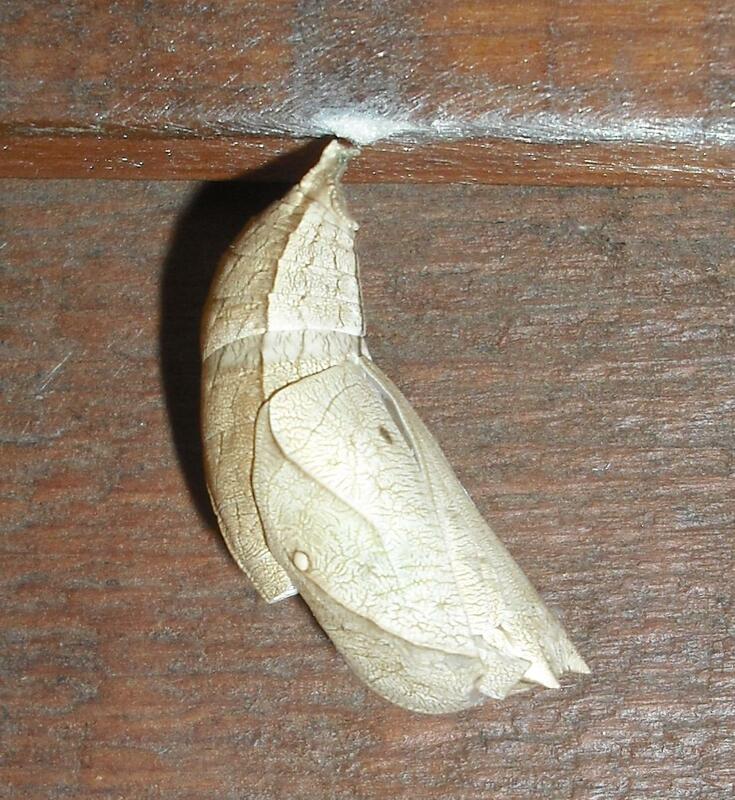 I posted the picture on Twitter, asking if anyone could identify the chrysalis. 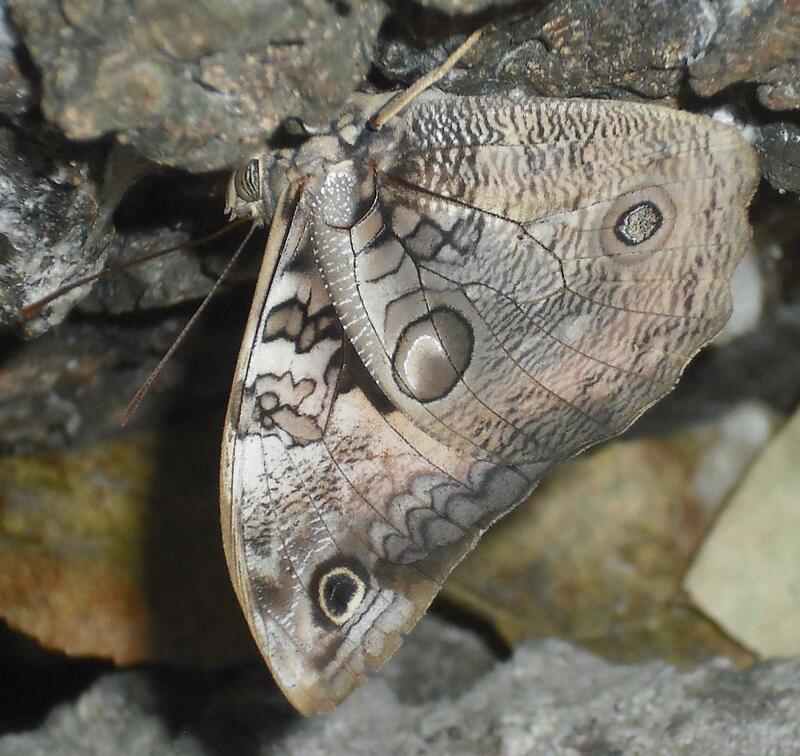 Andy Warren (@AndyBugGuy) replied that it was from an owl butterfly of the genus Opsiphanes. These are gorgeous butterflies! I was eager to photograph them. Fast forward to today. 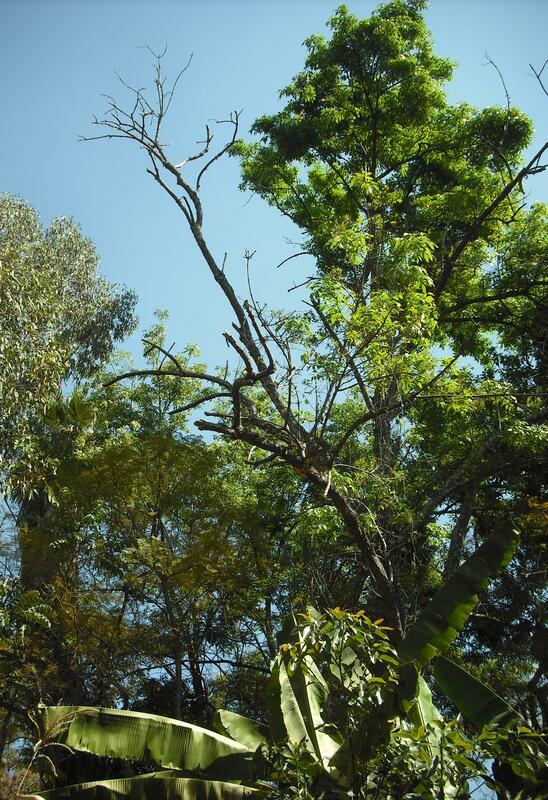 In Cuernavaca, it is the midst of the dry season. We haven’t had rain in weeks. Very few of the plants have flowers and the trees have lost foliage, but there is still a lot of greenery. And in the City of Eternal Spring, it is rarely cold. Today, the high was ~84 F (~29 C). The strong winds we often get this time of year had died down. It was beautiful out – perfect weather for finding butterflies! Plant life in the area where I photograph insects. Jan. 31, 2014. Cuernavaca, MX. Many of the butterflies in this area seem to come out around 11 a.m., after the birds have had their run of the place for a few hours. I started my search today around noon. Soon, I saw something moving near the base of a tree. I got closer and was thrilled to see not one but three owl butterflies! One of the butterflies (pictured below) quickly flew away. This owl butterfly flew off soon after I took its picture. The other two moved closer together and seemed unconcerned by my presence. I got within inches of them. 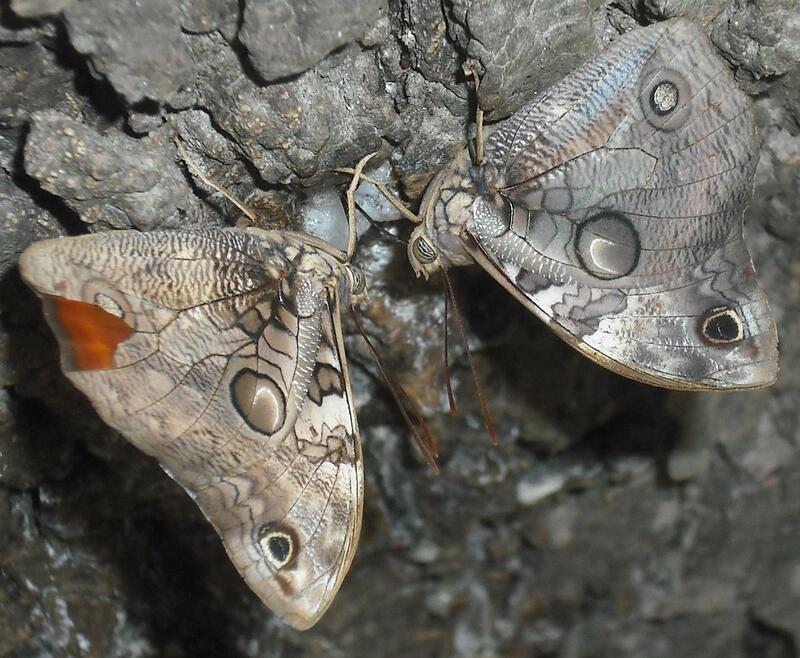 Two owl butterflies. Jan. 31, 2014, Cuernavaca, MX. As I got closer, I realized that the two butterflies were feeding on sap from the tree. 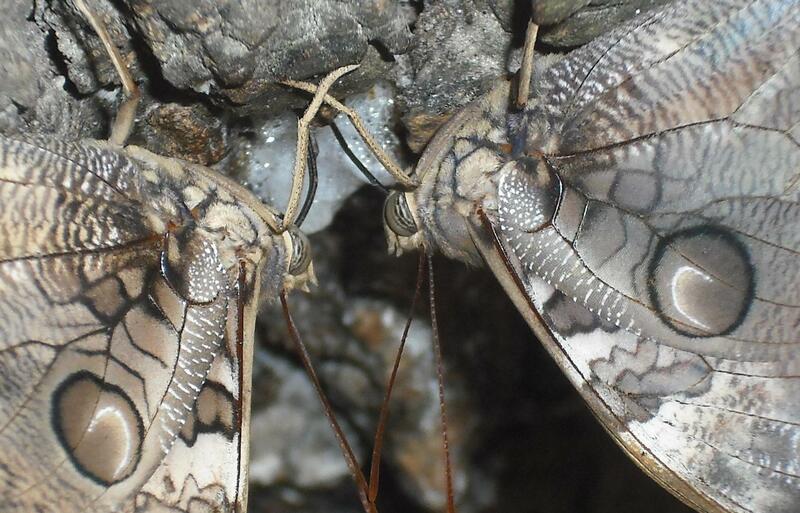 A close-up of the owl butterflies feeding on tree sap. I took picture after picture as they fed, and got several close-ups of each butterfly. 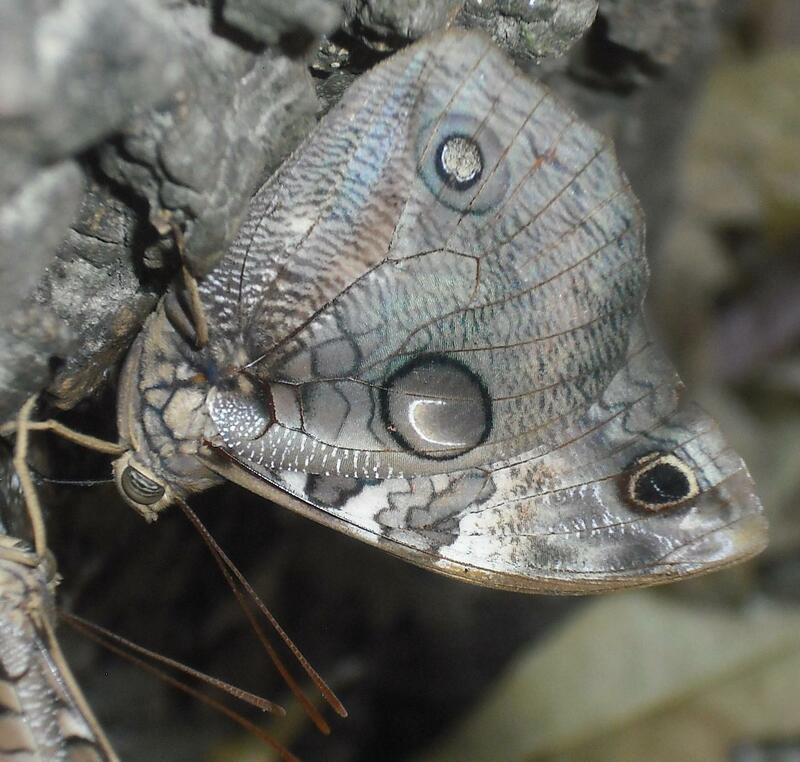 One of the owl butterflies had a blueish iridescence. 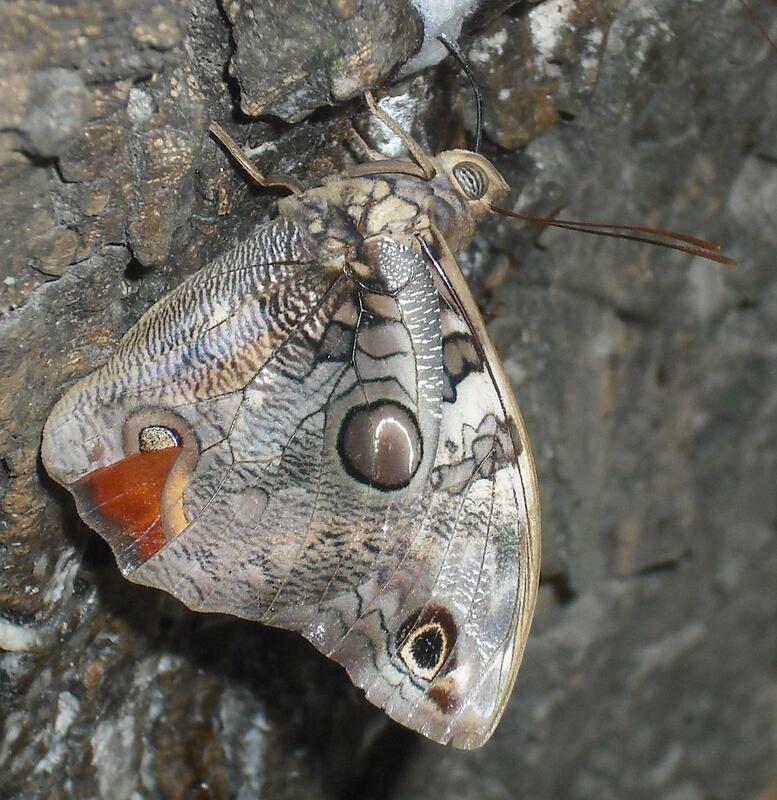 One of the owl butterflies had a torn wing, showing the beautiful orange coloring underneath. Three owl butterflies. The one on the left arrived after the two on the right. The third butterfly moved away from the others and began feeding further down the tree. A third owl butterfly feeding on tree sap. 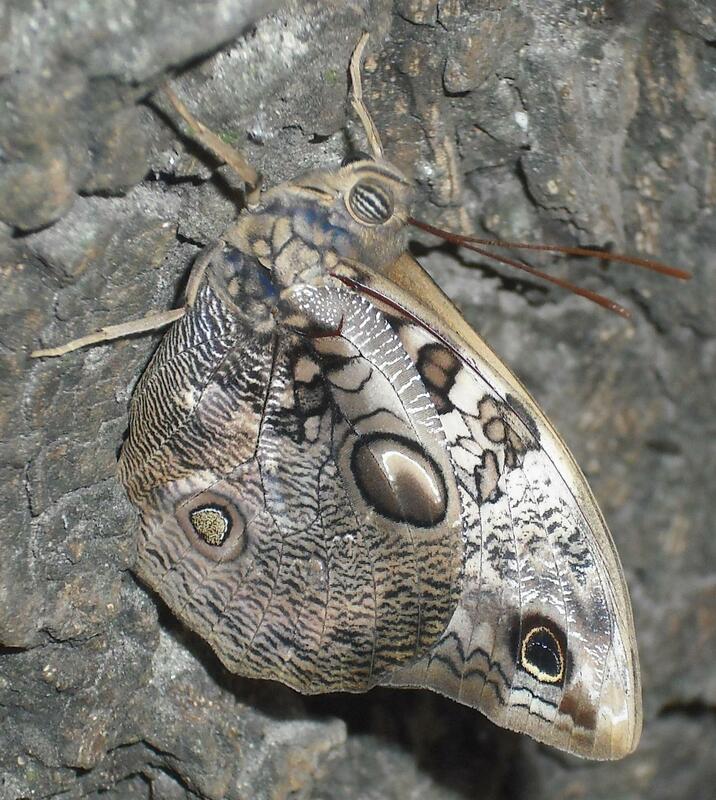 A few hours later, I returned to the same tree and found another, smaller owl butterfly. The sun was now shining at a different angle and this butterfly was out of the shade, so I was able to photograph it under natural light. Another owl butterfly, photographed a few hours later. 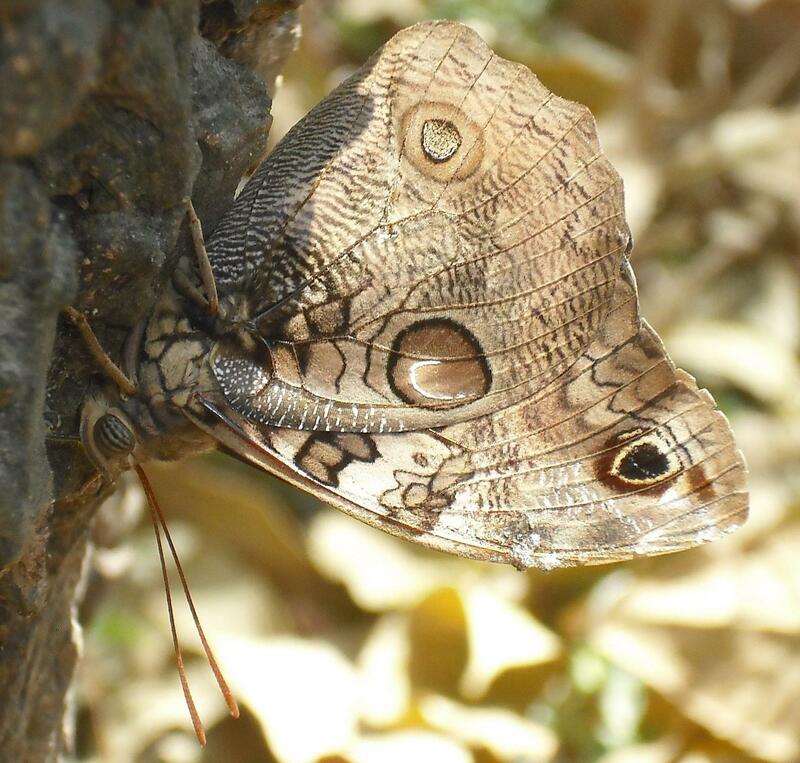 After I posted some of these photos today on Twitter, Andy confirmed that the butterflies likely belong to the species Opsiphanes cassina fabricii, also known as the split-banded owl butterfly. I saw several other species of butterfly feeding on the sap from this tree today. (I felt as if I had hit the jackpot!) But I’ll save those for another post. Right now, I’m still reveling in the beauty of these creatures.